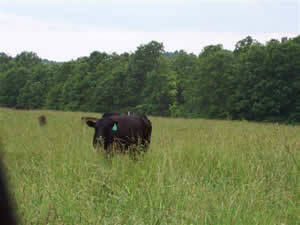 Like all grass-fed beef, Missouri Grass Fed Beef's meat is lower in fat, so our meat cooks faster than corn-fed beef. To maximize your enjoyment of our products, we offer the following cooking tips. Also, we've provided some delicious recipe suggestions to try. Bring your grass-fed beef to room temperature before cooking, but don't use a microwave to unthaw it. One of the "secrets" to moist meat is to always use tongs to turn your beef, never forks. Forks will pierce the meat and allow the juices to escape. When grilling, sear the steak quickly for no more than 1 minute on each side. Then, move the steak to the edge of the coals over lower heat and cook 3-4 minutes for the first side and 2-3 minutes for the second. If the steak is still too rare, put it back on the grill. For more information, view the grass-fed article "How to Grill the Perfect Steak." After cooking the meat, remove from heat and allow the meat to sit for 5 to 7 minutes, allowing the juices inside to redistribute evenly. The internal temperature will increase by 5 to 10 degrees during resting. Allowing meats to rest is another "secret" used by top chefs. For more cooking tips, see the Sustainable Table article.